The coat o airms o Moldovae consists o a stylised eagle hauldin a cross in its beak an a sceptre an an olive brainch in its claws. Accordin tae the author o the coat o airms, the eagle seembolizes the Laitin oreegin o the fowk. The kist o the eagle is protectit bi a shield that bears the tradeetional insigns o Moldavie: an aurochs heid wi the sun amang its horns. It conteens twa rhombi (the lugs) an aa, a five-petal flouer an a muin in a crescent phase. Aathing on the shield haes ane o the three traditional colours: red, yellae, blue. The coat o airms appears in the centre o the banner o Moldovae. 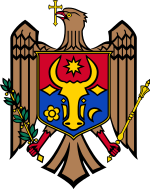 Wikimedia Commons haes media relatit tae Coats of arms of Moldova. This page wis last eeditit on 29 Juin 2016, at 19:36.